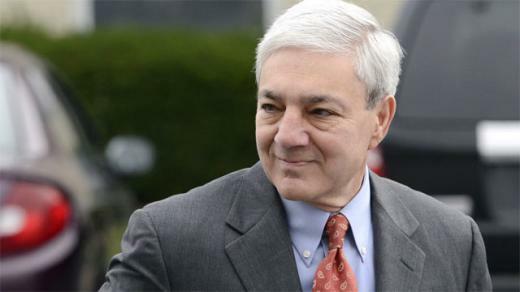 The Attorney General's office says former Penn State president Graham Spanier's argument to have criminal charges dismissed is off base. In the latest filing in U.S. Middle District Court, Senior Deputy Attorney General Michael Harvey says Spanier's arguments are not legitimate and again asks the court to throw out the lawsuit. Spanier filed the lawsuit in federal court in March hoping to have his criminal charges dismissed. Spanier, along with two other former Penn State administrators, are accused of an alleged cover-up of the Jerry Sandusky child sexual abuse scandal. The suit specifically targets the tactics of former Chief Deputy Attorney General Frank Fina, who was lead prosecutor in the Sandsuky grand jury investigation, saying Fina used dishonesty to obtain Spanier's testimony and acted in "bad faith." Harvey's filing Tuesday targets Spanier's latest arguments, saying "cases involving arrest and seizures made under an allegedly unconstitutional statute, alleged collusion between a prosecutor and a court to coerce grand jury testimony and an allegedly retaliatory disciplinary action, all failed to come within the bad faith exception." Harvey argues case law shows that allegations a prosecution was motivated by malice or discrimination unrelated to the crime at issue "do not constitute 'bad faith.'" Harvey also notes that a magisterial district judge approved Spanier's criminal charges following a preliminary hearing, therefore prosecutors had a reasonable expectation of reaching a conviction in the case. Additionally, Harvey says Spanier's complaints that his testimony before the grand jury and how it was elicited can be addressed by the state court, meaning it is unnecessary for the federal court to get involved in the criminal proceedings. "If that court agrees with plaintiff, the court can suppress the evidence. Likewise, if the charges against the plaintiff lack foundation they can be dismissed. Thus the state court can vindicate any constitutional rights that may have been infringed," Harvey writes. Spanier's attorney, Elizabeth Ainslie, argues Fina allowed Spanier to testify before the grand jury after Penn State Special Counsel Cynthia Baldwin said she represented Penn State as an institution, not Spanier individually. Spanier, former Athletic Director Tim Curley, and retired Senior Vice President for Finance Gary Schultz say they thought Baldwin was their personal attorney. They believe her testimony before the grand jury violated attorney-client privilege and therefore criminal charges should be dismissed or her grand jury testimony suppressed from any criminal trial. Harvey also argues Spanier failed to discuss and properly articulate how the due process clause of the 14th Amendment of the U.S. Constitution relates to his request for the case be dismissed. The 14th Amendment says no state may, "deprive any person of life, liberty, or property, without due process of law; nor deny to any person within its jurisdiction the equal protection of the laws." Harvey adds there is no federal right to counsel before an investigatory grand jury. "To the extent the plaintiff claims that he was denied procedural due process because he was effectively denied counsel in the grand jury proceedings, his federal claim is insufficient," Harvey says. He adds that a "procedural error" does not justify federal relief. "Beyond that ... any procedural due process claim asserted by the plaintiff is premature because the criminal proceeding is ongoing. Plaintiff still has opportunities in the criminal action to raise the issues asserted in this case, and has in fact done so in motions to dismiss the criminal complaint and quash the presentment," Harvey writes. "For this reason also, plaintiff's due process claim should be dismissed." Prosecutors have argued through legal documents that Baldwin's testimony was not part of the evidence used to establish probable cause during the defendants' preliminary hearing therefore the prosecution has a legitimate case. The prosecution also says the defendants' claim that Baldwin had a conflict of interest by representing both the defendants and Penn State is wrong. Instead, they say the defendants and Penn State shared interests. Additionally, the Attorney General's office argues that any advice Baldwin provided the defendants would not have changed the outcome of the grand jury investigation. And if the defendants assumed Baldwin represented them individually, the agency says the claim of an attorney-client privilege violation still does not exist due to a crime-fraud exception. Dauphin County President Judge Todd Hoover is presiding over the case for Spanier, Curley and Schultz. The criminal proceeding is taking place in Dauphin County because that is where the grand jury met and where the charge of perjury allegedly occurred. Hoover has not issued a ruling on defendants' motions to dismiss charges and suppress Baldwin's testimony from trial. Sandusky was sentenced to 30-60 years in prison for 45 counts of sexually abusing 10 boys over a 15-year period. 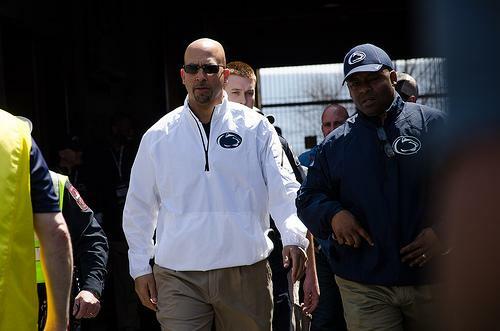 In James Franklin's eyes college football players don't really get Sunday off. There are medical treatments for bumps and bruises, study halls, conversations with coaches, and most of the day spent around the football building. That's why, under Franklin, the Nittany Lions will practice on Sundays -- while Saturday's game is still fresh in everyone's minds.